DealRoom is not just the best due diligence management platform, but it also includes a secure virtual data room within the platform. When traditional document storage software, such as Intralinks and Ideals virtual data rooms, first came out, they were revolutionary. No longer did teams have to scan documents one-by-one in a physical data room to complete diligence. No more traveling to an office because confidential documents couldn't leave the property. The idea of “the cloud” was unique and convenient. VDRs were a game changer. But then, they too got left behind in the past. They created this inefficient mergers and acquisitions diligence process that included Excel trackers, long email threads, and various platforms for communication. 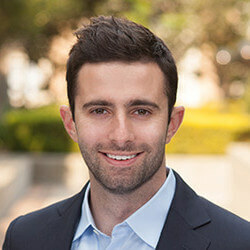 DealRoom wanted to capture the good qualities of an online data room, but bring them into the present time and take advantage of technology advances. That’s why DealRoom is a diligence management platform that hosts an electronic data room. 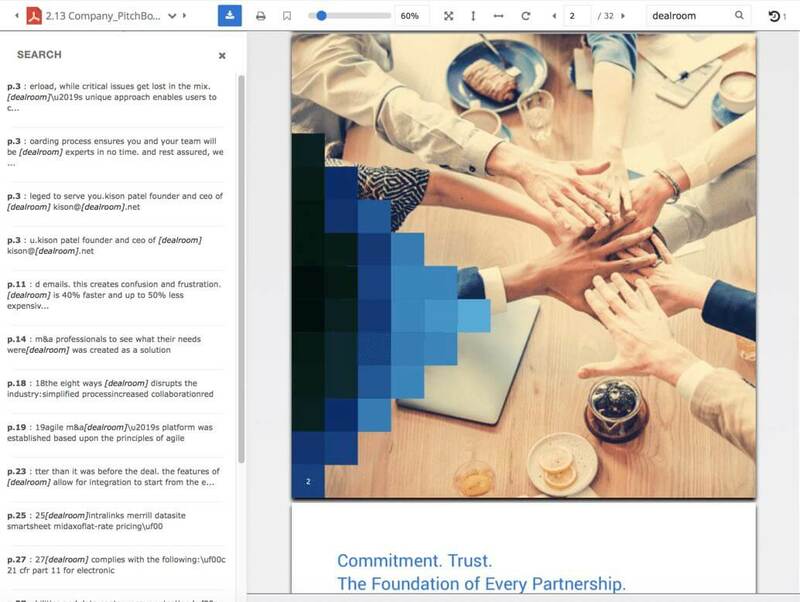 This allows documents and files to be safely uploaded, stored, and shared, but also enables collaboration and unique capabilities that weren’t previously available to deal teams. All the deal’s management and data is centered in one database and updated in real time. Are you ready to make your data room M&A process organized, effective, and innovative? Contact us to get all the information about DealRoom's virtual data room. Traditional online repository often looks well, ancient. Their design is outdated and the software isn’t intuitive or user friendly. At DealRoom, we pride ourselves on having an intuitive design that doesn’t look like it’s stuck in the 90s and providing customers with innovative virtual deal room services. As with any new technology, there is a learning curve, but due to the smart nature of the electronic data room, users are able to confidently use the room in no time. Plus, our customer success staff is available 24/7. 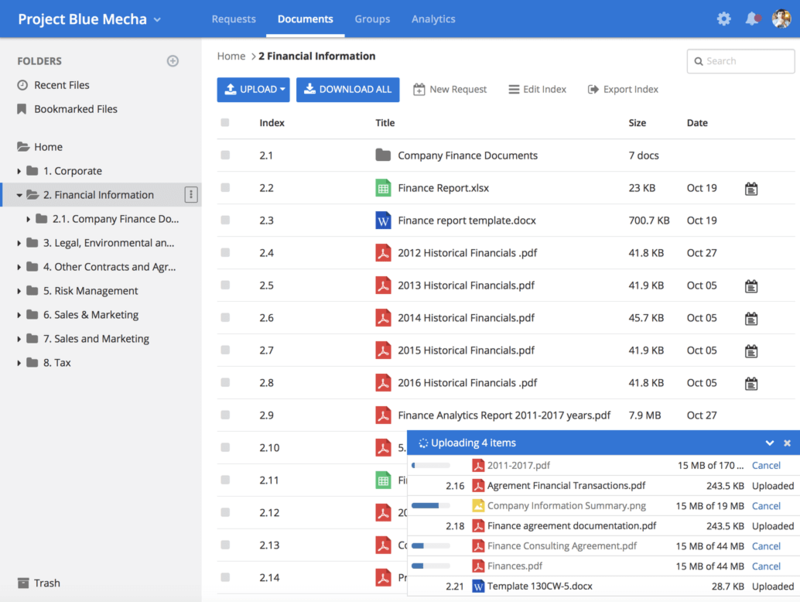 Our virtual due diligence data room empowers teams to transform, retrieve, and classify documents and folders all within our m&a platform. Benefit from features such as bulk upload, built-in document view, smart search, drag-and-drop, and more. The online data room's communication capabilities enable teams to stay in constant contact with each other, without ever having to leave the platform. Leaks, hacks, inaccurate accessibility, etc these are all common worries surrounding data. DealRoom’s virtual data room solution understands that all information that goes through the secure VDR, whether it be files, documents, or communication, is highly confidential and needs to be stored in a tight, secure location. Our data room structure is built to protect your information from any security worries or threats. And our simple permissions make sure that users only see what you want them to see. Have you ever wanted to view a file in a traditional virtual due diligence room, but had to download the file first, then view it online? 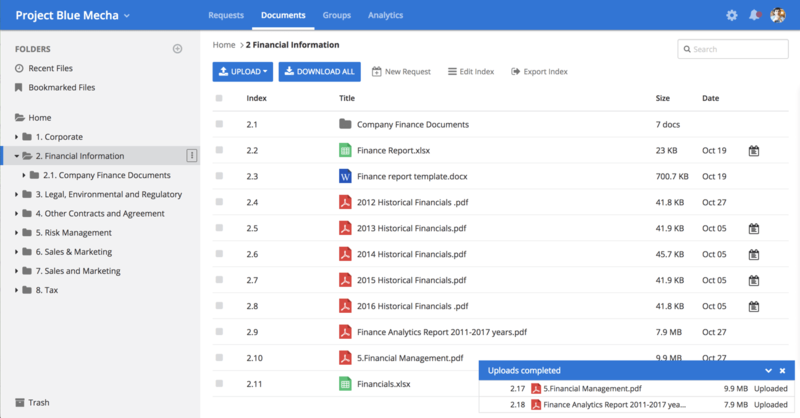 No more downloading and switching between platforms just to view an Excel or document file. DealRoom’s convenient built-in Excel and document viewer gives users file visibility, without ever having to leave the data room software. Less time spent switching between platforms means more time focused on swiftly completing diligence. Nowadays, data sharing is everything. With traditional virtual data rooms, teams usually permit bulk downloading. However, once this is done, everything is viewed offline and no data is captured. Since DealRoom’s online due diligence data room enables teams to do everything through the VDR software, insightful data analytics are captured and can be analyzed such as document activity and buyer engagement. All analytics can be spun quickly into a PDF or Excel file for easy-to-understand reporting. Our virtual data room is smart, quick, and secure.  In combination with project management, DealRoom equips teams with the software they need to close deals faster. Stop wasting your efforts with time consuming data room inefficiencies, and focus on closing deals faster. DealRoom’s innovative technology and due diligence tools enables your process to run smoother than ever before. We will have your room setup and ready for uploading within minutes. Our customer staff success team provides onboarding and any additional training needed. Artificial intelligence enables the online data room to have smart features, which save users valuable time. This includes full-text search, suggested files, live-linking, document recall, and more. 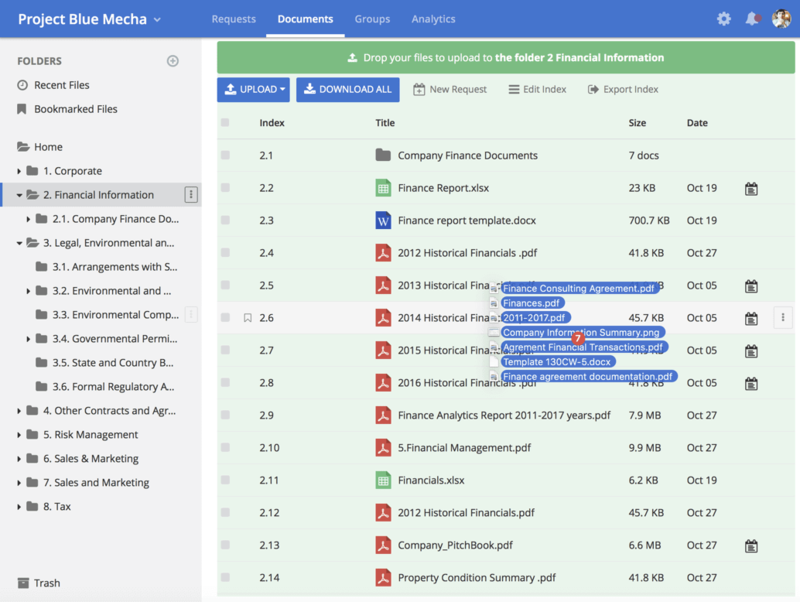 DealRoom’s due diligence tools, requests tab, and data room work together to keep everything in the vdr software. Documents uploaded into the data room can be accessed to answer diligence requests. Just like you bookmark sites you often frequent, users can bookmark files for convenient access. Bookmarked files can also be filtered by upload date. Our support team is made up of former industry professionals who have been in your shoes and can improve your due diligence process. Contact us 24/7 for any questions, comments, or concerns. A virtual data room provides clean room and storage for sensitive information such as financial and human resources information, intellectual property, legal documents etc. They also are a place where interested third parties across all time zones can receive access and be granted specific permissions to the most updated documents and folders. Companies need to have full trust in their VDR provider and due diligence tools. At DealRoom, we promise to provide our customers with the VDR software and data room services they need. Never worry about data protection again, all information is secure in the data room. Agile due diligence data room helps teams complete diligence up to 40% faster. Simple, easy to change, permissions keep you in control of visibility in VDR at all times. Integrate with modern and useful tools such as Slack, Salesforce, and Office 365 to simplify your M&A process. 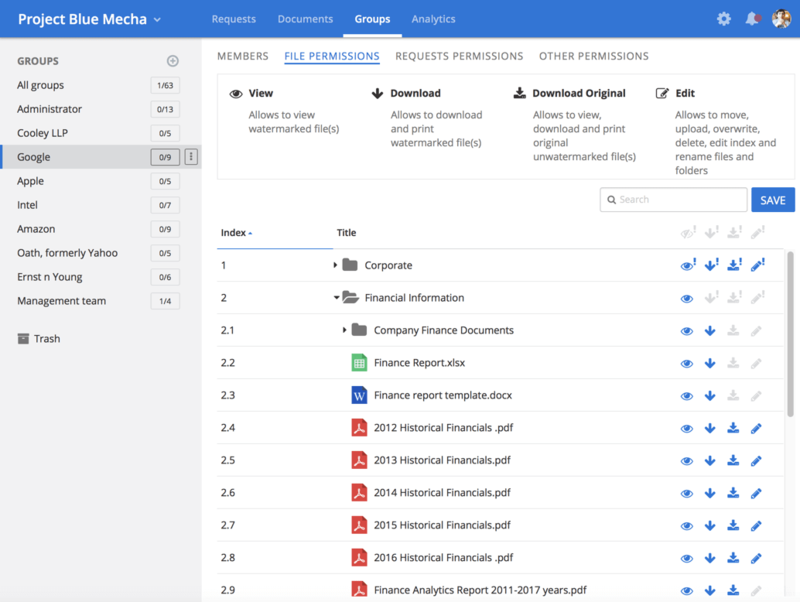 The virtual data room’s drag-and-drop capabilities enable users to upload documents and files, rearrange the index, and move files into folders in seconds. Any time a document or file is uploaded users receive an email confirmation, and don’t worry, you can set the notification frequency. Quickly search and find the files you need inside your data room with DealRoom’s VDR smart full-text search feature. Easily access the entire virtual data room access, which users can rearrange with drag-and-drop, renumber, and export to PDF or Excel. DealRoom data room solution tracks the amount of time any user spends on each document, file, and request. The audit log tracks every movement done within the online data room service including logins, folder creation, request priority status, document uploads, and much more. 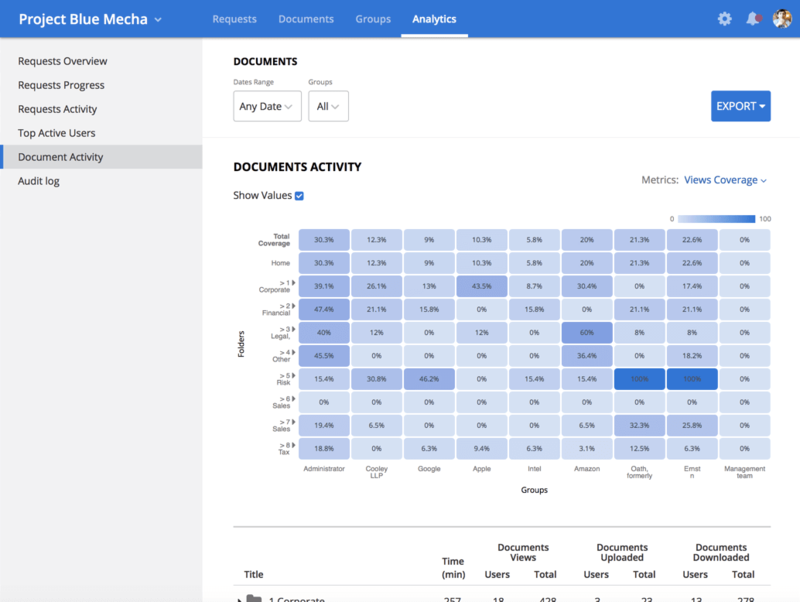 Get insight with different filters on the document’s activity heatmap such as; views coverage, time spent, date range, and overall views. "I have experience with a few different Virtual Data Room software. Merrill DataSite, Donnelly, etc. Most due diligence data rooms focus only on privacy and functionality at the expense of general user interface. I found DealRoom to be incredibly easy to use, despite having never used it before. This ease of use was greatly augmented by my experience with my Dealroom's customer success manager." There are so many traditional data room solutions available now, teams have to spend time on data room due diligence or use virtual data room review sites to find the right fit. At DealRoom, one of our main differentiators is our pricing. Unlike most online data room providers we don’t charge per page, or per user, or based on data. We charge a simple, one-time flat rate with no additional overage charges. If you’re new to DealRoom, no problem. We offer a 7-day free trial for potential buyers and customers to test out the software and see if it meets their VDR needs. Forget about having to do virtual data room due diligence for every new deal. Our online innovative platform, built upon Agile principles, will help you close deals faster without compromising value.